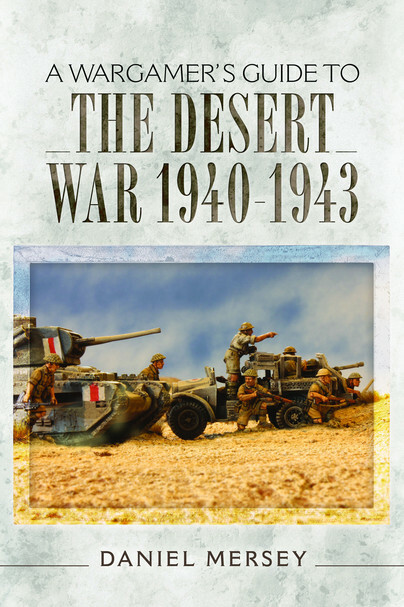 You'll be £12.99 closer to your next £10.00 credit when you purchase A Wargamer's Guide to The Desert War 1940 - 1943. What's this? Continuing this exciting new series of guides for wargamers, Dan Mersey gives a wargamer’s perspective on the North African campaign of World War II. Dan gives an overview of events from the opening British successes against the Italians, to the famous duels between Monty and the Rommel (the Desert Fox), right up to the US-led invasion of Operation Torch and the eventual defeat of the Afrika Korps, and offers advice on how to recreate these on the gaming table. Daniel Mersey discusses factors to consider when choosing an appropriate set of commercially available rules, or devising your own, to best suit the scale and style of battle you want and to capture the flavour of the period. The relevant ranges of figures and vehicle models are also reviewed. Analysis of the forces involved, organization, tactics and strategies will help with building your armies and there are interesting scenarios included. Whether this is a new period for you, or you are looking to refresh your existing interest in the period, this handy guide is sure to hold much if interest for you. Daniel Mersey knows his stuff when it comes to writing a book and keeping it on the matters relevant to the reader and the subject. This fine wargames book tackles what the average wargamer will want to know for a table top game and concentrates on the various aspects of it. This is a volume that should be on any wargamer’s bookshelf. Considering the numbers of people enjoying this competitive activity, there are relatively few books on war gaming. The author has provided a guide that will appeal to novice and skilled war gamer alike – Highly Recommended. From various modellers and in various scales this give a good idea of how good these can look when ready for use on the gaming table, and some inspiration to get some modelling done in readiness for gaming. A neat guide. Highly useful for the beginner looking to start gaming the North African campaign, even the more experienced gamer will find some useful stuff here.